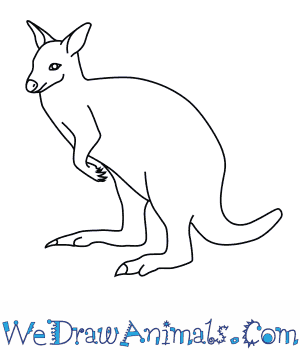 In this quick tutorial you'll learn how to draw a Bennetts Wallaby in 7 easy steps - great for kids and novice artists. At the bottom you can read some interesting facts about the Bennetts Wallaby. 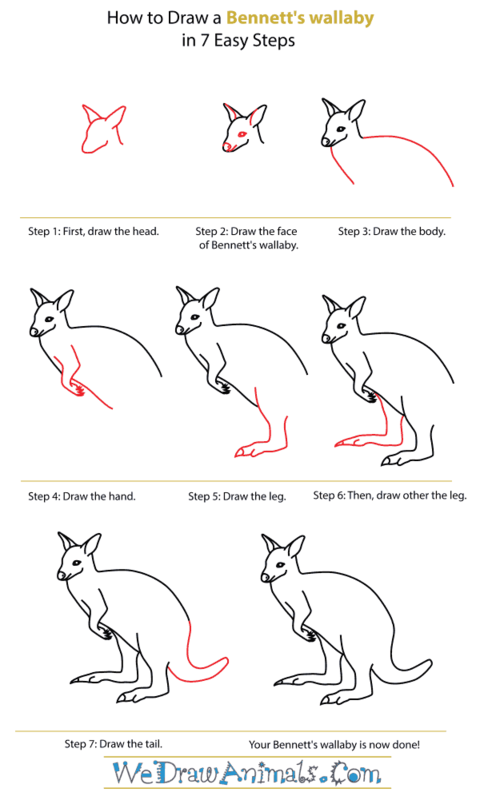 Step 1: A Bennett’s Wallaby is like a small kangaroo. They live in the wilds of Australia. 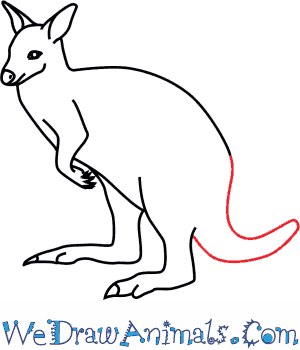 Like their cousins the kangaroos, wallabies are marsupials, have pouches, and jump everywhere on their hind legs. They can jump up to five feet in a single leap! 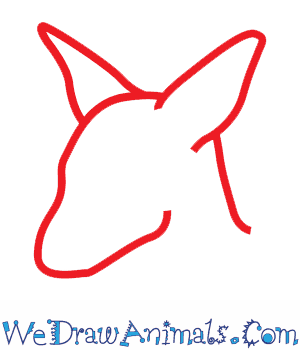 To draw one, start by drawing a sideways rounded ‘V’ shape for the head and add two triangle shapes for the ears. 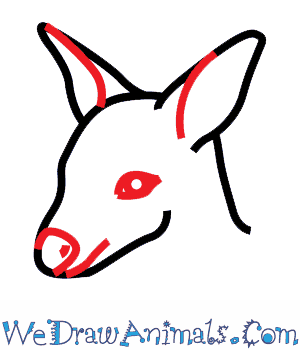 Step 2: Add details to the ears, a circle for the nose and two dots for the nostrils. Then add another circle for the eye, and a small line for his mouth. Step 3: Draw a short sloping line in front for his chest. Draw another longer, curved line for his back. 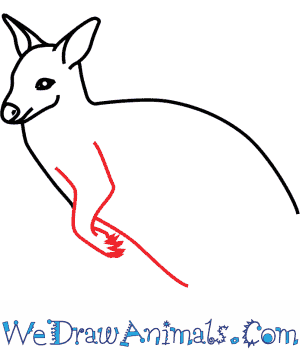 Step 4: Draw the wallaby’s arm. It should be shaped like a backwards ‘5’ with little fingers on the end. Draw a line behind his arm to make his belly. 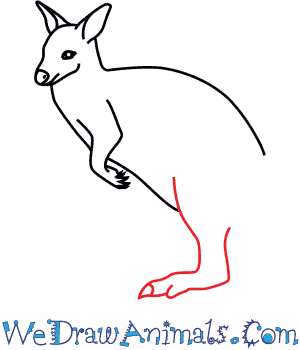 Step 5: The wallaby has large, powerful feet like his kangaroo cousins. Draw two parallel lines that look like a backwards ‘L’ and end in two toes. Step 6: Draw another, smaller leg behind the first one. 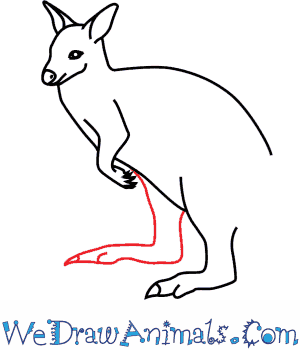 Step 7: Last, draw the wallaby’s tail curving behind him. His tail is extremely important in helping him keep his balance when he is standing still or jumping. The Bennett’s wallaby is a marsupial native to the island of Tasmania and eastern Australia (where it is called the red-necked wallaby). Marsupials are mammals that carry their young in a pouch. 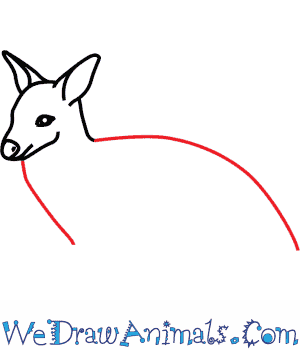 A popular example is their relative, the kangaroo. Bennett’s wallabies can be seen at zoos around the world, and they are also kept as pets in Australia. They are solitary animals, but they are sometimes in groups called mobs. These groups share the same feeding areas. They graze on herbs and grasses. During open season, they are hunted by humans for their meat and fur. In the wild, they live in eucalyptus forests and open areas near the forests. Adults are about two feet tall and weigh 30 to 50 pounds. Females are slightly smaller than males. Like kangaroos, they move around by leaping. One leap can take them up to five feet. Joeys are baby wallabies. When they are born, they are only about a half an inch long. Joeys make their way into their mother’s pouch by grabbing onto her fur and climbing into it. They stay there for about eight months. Mothers give birth to one joey at a time.